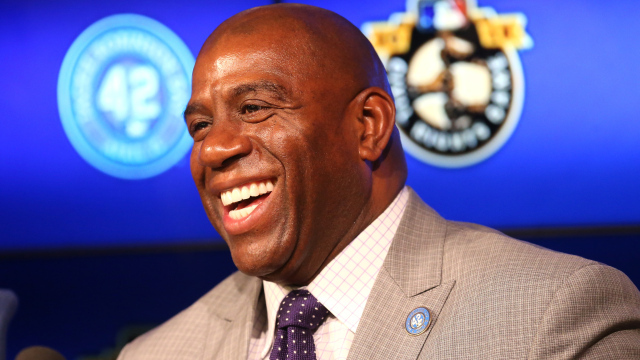 LOS ANGELES (CBSLA.com) — NBA Hall of Famer and entrepreneur Earvin “Magic” Johnson and labor leader María Elena Durazo were named vice chairs of LA 2024, the city’s Olympic and Paralympic committee. The pair will join Olympic swimming champion Janet Evans as vice chairs on the board of directors, LA 2024 officials said. The City of Angels was selected in September, along with Budapest, Hamburg, Paris and Rome, after Boston withdrew their bid due to costs. Los Angeles has previously hosted the Olympics in 1932 and 1984. The Lakers icon, NBA Hall of Famer and part owner of the Los Angeles Dodgers was a member of the USA basketball “Dream Team” at the 1992 Barcelona Olympics. Durazo, a longtime labor and immigrants rights leader, has worked with the LA County Federation of Labor, AFL-CIO, UNITE-HERE, Local 11 and HERE International Union, will help LA 2024 engage with the city’s working families and immigrant communities, according to LA 2024 Chairman Casey Wasserman. “With Durazo’s support and guidance, we’ll ensure that the benefits of the Games will be realized all across our city, and that no community will be left behind,” Wasserman said in a statement.